TL; DR: In today’s heavily connected business landscape, being able to collaborate on the go isn’t a luxury — it’s a requirement. And Cisco WebEx is allowing teams and stakeholders to meet wherever they are through innovative conferencing software. The solution leverages the power of the Cisco Collaboration Cloud that delivers the infrastructure necessary to facilitate real-time web communications. Whether users are halfway around the world or in the next room, the Cisco WebEx platform allows for seamless video conferencing, screen and file sharing, and much more. We recently sat down with Mark Nash, Director of Meeting and Team Collaboration, who told us how an increasing number of businesses are integrating Cisco WebEx into their IT assets to bring greater mobility to their operational strategies. In the 1990s, the Chicago Bulls were an unstoppable force in the NBA. And, if you ask anyone but the star player himself, Michael Jordan was widely considered to be the driving factor in the team’s success. However, Michael was always quick to correct his fans. “Talent wins games, but teamwork and intelligence win championships,” he famously said. Michael knew he was good — the best if you asked his peers — but he also knew it wasn’t a one-man show. The team won championships because it worked as a single unit, combining the collective strengths of all its talented players. The same case for teamwork can be made in the business world. Nearly 100% of employees and executives believe a lack of team alignment can have dramatically negative impacts on project execution. Surprisingly, however, 40% of this same group believe their organizations don’t collaborate enough. This lack of collaboration may be due to problems in company culture. But, more times than not, it’s a result of not having the right tools to facilitate communication. That’s why an increasing number of organizations are turning to the collaboration and conferencing tools delivered by Cisco WebEx. Cisco WebEx delivers cloud-based collaboration solutions so teams can interact and share ideas in real time. The company’s cloud-based platform allows team members and stakeholders to meet wherever they are and on whatever devices they’re using. With screen and file sharing, video conferencing, and other communication-centered functionalities, Cisco WebEx empowers remote teams to share the ideas that keep projects and revenue streams flowing smoothly. “WebEx is a meeting platform with a particular line of business applications around training, support, events, and webinars,” said Mark Nash, Director of Meeting and Team Collaboration. A significant milestone in video conferencing history, CU-SeeMe was developed by the Cornell University IT department in the early 1990s. Just a few short years later, the world would see the release of WebEx’s landmark conferencing software. “The heritage of WebEx began with the idea that people were moving from meeting in the same physical place to wanting to meet more remotely,” Mark said. As remote work became more and more popular in the heyday of the computer revolution, it became clear that conferencing was the easiest and most cost-effective way to hold meetings. In the early days of conferencing, collaboration methods were still on the primitive side, often requiring workers to swap floppy disks containing project files at the office. The popularity of email made it possible to attach an important file here and there, but was ultimately inefficient. Transmitting video and files quickly became the next logical step, especially considering the emergence of webcams in the 1990s and camera phones shortly after. Not only could larger files now be quickly shared within a group, but the use of video made tutorials and troubleshooting much more intuitive, as participants could actively see what was being presented in real time. WebEx Communications, Inc. was founded in 1996 by Subrah Iyar and Min Zhu. Its flagship video conference call software, originally known as ActiveTouch, was launched shortly after. Nearly a decade after its founding, the company renamed itself Cisco WebEx due to a merger between the two companies. “The advantage that Cisco has is its long heritage of being really strong in the video conferencing space,” said Angie Mistretta, Sr. Director of Collaboration Solutions Marketing. Cisco, manufacturer of the Linksys brand of hardware products, such as webcams, had released TelePresence in 2006 — a range of remote hardware products designed to make participants feel as if they were in the same room. Two years later, Jabber XCP was released as the commercial equivalent of the XMPP communications protocol, which allows for real-time data exchange. Further, Cisco’s prominence in the video conferencing field was not only boosted by WebEx, but by the acquisition of Tandberg, a Norwegian video conferencing hardware brand. Ultimately, the goal of video conferencing is to make things as easy as possible for the end user. 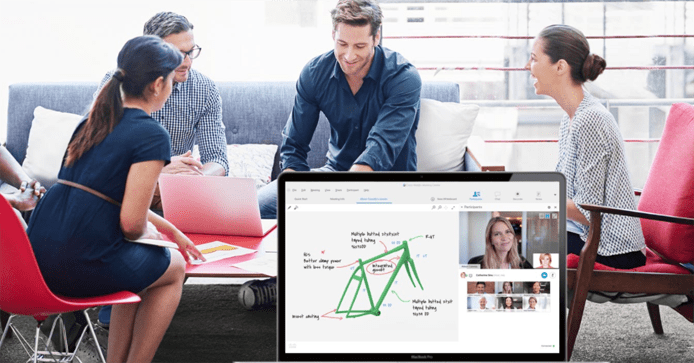 In keeping with that goal, Cisco WebEx is packaged as an all-in-one system for use in any type of meeting setting. Previously, the end user was typically slapped with the role of middleware, switching between multiple pieces of software within the same meeting. With WebEx, the user can simply send out a meeting room address to participants within seconds of deciding to hold a meeting. WebEx offers several video conferencing solutions to improve workflows. WebEx’s web conference platform allows users to join from any device and record content. Additional features include screen sharing, whiteboarding, and integration with popular productivity and email apps. For large groups, WebEx Event Center makes it easy to deliver interactive presentations and multiple presenters. Similarly, WebEx Training Center allows the host to train multiple people at once, complete with built-in eCommerce functionality and the ability to create libraries of pre-recorded sessions. The advantages of video conferencing — especially with WebEx — are numerous. Not only are they an ideal solution for reaching out to remote employees, but also provide extensive collaboration capabilities even for small teams within the same building. More than 113 million professionals join web conferencing meetings each month, and companies that have embraced video collaboration tech have experienced an average growth of 300%. For more than two decades, WebEx has dominated the video conferencing market — and with good reason. WebEx, together with its parent company Cisco, constantly refines its already powerful platform to create the best user experience possible. Angie told us several major — although yet to be specified — features will be launched in 2018. WebEx takes the pain out of holding meetings, collaborating on projects, and connecting business leaders to an increasingly remote workforce. With Cisco WebEx, businesses can preserve that tight-knit spirit of teamwork whether stakeholders are miles away or in the next room.